Sunmolin Plastic Technology is a professional TPU coated webbing manufacturer with 11 years experience, this webbing has advantages of high tension, waterproof, easy to clean, good abrasion resistance and eco-friendly. It’s widely used in pet collar, subway&bus handle strap, waist belt, bag straps. Sunmolin’s TPU coated webbing are coating TPU(Thermoplastic polyurethanes) material on the webbing. 1. Imported tpu raw material, eco-friendly. 3. Durable, more than 5years service life. 4. Dirt proof, tpu coated finished makes webbing easy to clean. 5. Waterproof, can used in out moist place. 6. Abrasion resistance, high tension. Material	Webbing and outer rubber need to match. Normal specification: 25*3mm / 28*3mm / 20*3mm / 25*3.4mm / 25*4mm. Size error: standard size within plus or minus 1%, using vernier calipers to test. 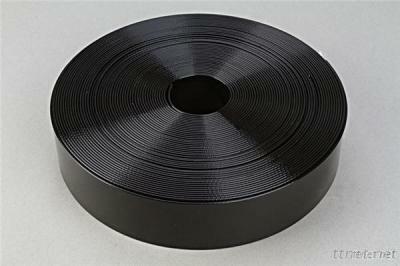 Webbing and rubber's viscous force: 10 mm width, peel strength is bigger than 16 Newton. Using stripping test machine to inspect. Environmental standards: in line with the ROHS, REACH, see the SGS inspection report. Flame retardant standard: England vehicle fireproof rating BS6853: 1999 Ib. 4) Safety equipment (safety harmless) and so on.